Learn how to translate rotational motion into other types of motion. Create a “Cuckoo Clock” mechanics. 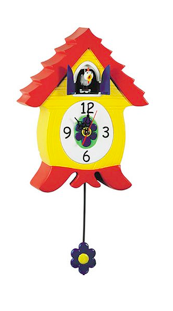 Cuckoo Clock typically has an automaton of the bird that appears through a small trap door while the clock is striking. In this exercise, you will create mechanisms for 1) a door that opens and closes, and 2) a bird that leaps forward and backward. Once you have your mechanics working, you may automate the motion with your DC motors and servo motors controlled by Arduinos. Important: Explore and get the mechanics to work first before trying to make it work with your DC motors or servo motors. Create a mechanical construction of a trap door that opens and closes. Here is an example. Create a mechanical construction that moves the bird forward and backward. Put the door and bird together so that the bird sticks its head out when the door opens and goes back as the door closes. Once you get the mechanics to work, try to control it from Arduino. Post descriptions and photos (and or video) of your “Cuckoo Clock” mechanics on the course website. Please bring your “cuckoo clock” mechanism for in class showcase on Wednesday Oct 26. “Basic Mechanics: Converting Motor Motion to Usable Motion.” Physical Computing Chapter 10, pp. 271-283.